Location: N36:49.850, W003:24.021, this is a GPS reading at the summit. Saddle: supposed to be a pass called Venta Cuatro Caminos at 895 meter. Just east of the peak is a saddle at location N36:50.035, W003:21.238, with elevation 1050 meter. 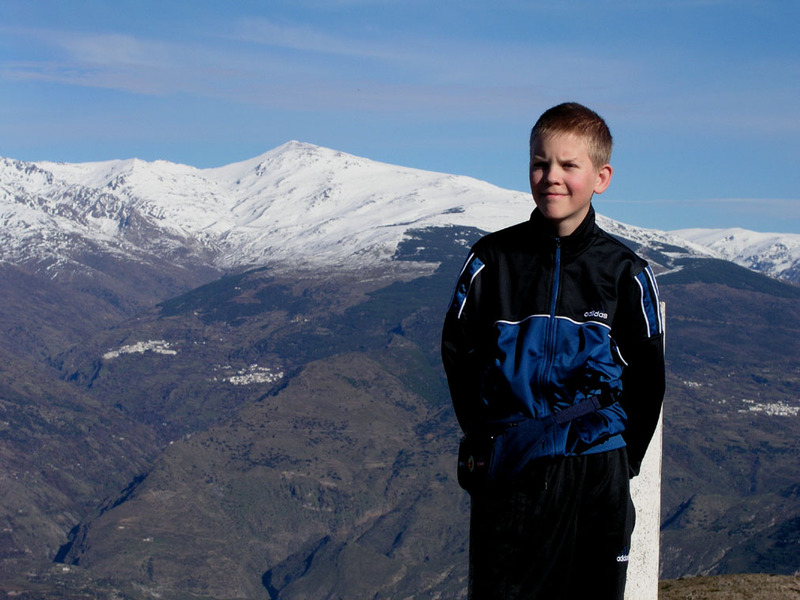 How to get there: See the description under Mulhacén 3482 meter, in order to locate the village Orgiva. We drove south from Orgiva on A348 across the bridge and turned left. After 4 km (from the bridge), turn off the Hwy. right and follow the winding road SE42 to its highest point. This point has GPS coordinates North: 36:50.432, West: 003:21.996 and elevation 1120 meter. 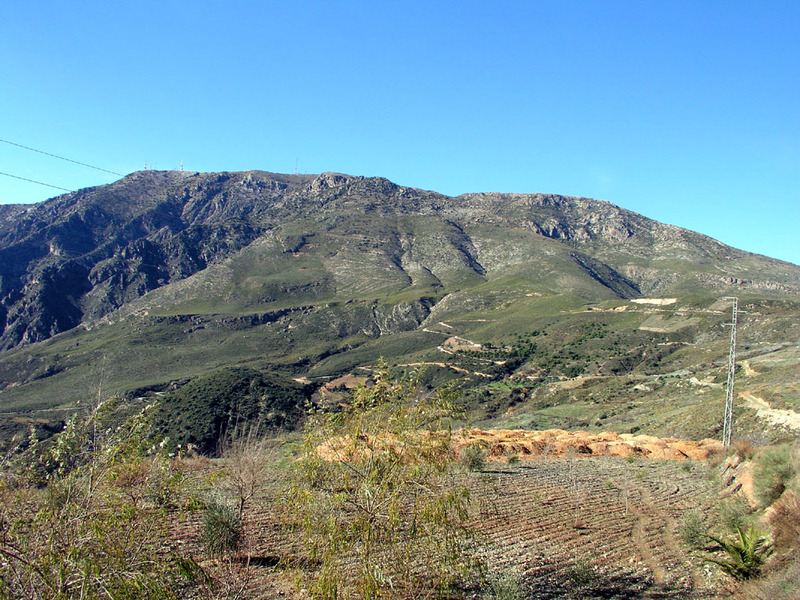 There is a road going right here with a sign for a village 5 km and additionally, a sign for Motril. Take this road and look for a small, paved road forking right after a few meters. This road will climb the mountain in many switchbacks. The road has several potholes, but is quite acceptable for an ordinary passenger car. Park whenever you want to continue on foot. The road can take you essentially to the top near some antennas. Route description: Follow the road as it climbs the mountain. When reaching the top with antennas, visually locate the highest point. It is a very short, easy stroll to the summit marker. Comments: I visited this summit with my son Pål Jørgen. Our purpose was really to find a good viewpoint towards Mulhacén, 3482 meter, that we climbed the previous day. Somewhat to our surprise we found an easy access to what appears to be the highest mountain between the Sierra Nevada range and the Mediterranean. The view of the Sierra Nevada from the south cannot get any better. We continued down the road with a sign for Motril, this turned into a very rough gravel road, an unblievable descent of a 1000 meter vertical. We visited the 1050 meter saddle documented above. The alternative name and the location of the lowest saddle have been provided by Eberhard Jurgalski. 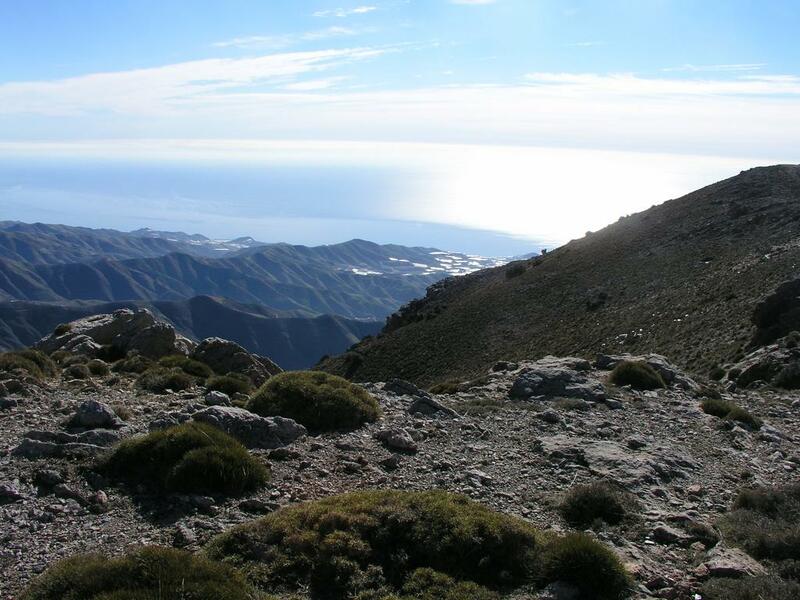 On the summit of Sierra de Lújar, Mulhacén (3482m) behind. The Mediterranean is just below this mountain. Sierra de Lújar as seen from the east side. Sierra de Lújar as seen from the west.